MUMBAI: The American fantasy television series, Game of Thrones, has a massive popularity in India. With the eighth and final season arrived now, all the die-hard Game of Thrones fans cannot contain their excitement about it. 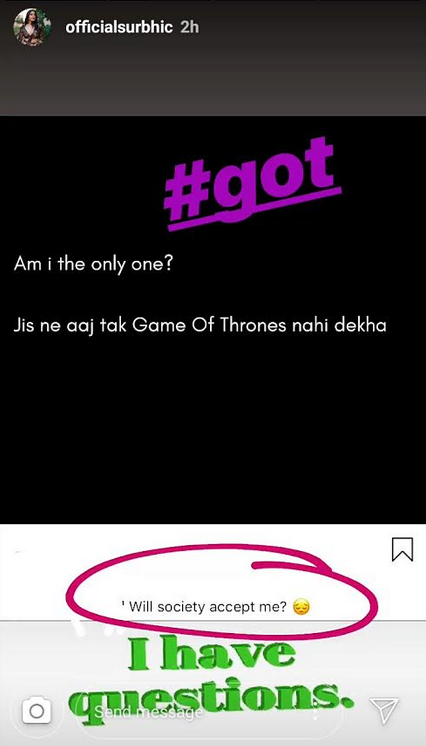 Such is the popularity of Game of Thrones that many often react weirdly to those who haven't watched the show yet, and Ishqbaaaz actress Surbhi Chandna is definitely one of them. Apart from her acting skills, Surbhi is also known for her infectious sense of humour. She recently took to her Instagram story to take a dig at herself for not watching the show and asked for the society’s acceptance, which was truly hilarious.